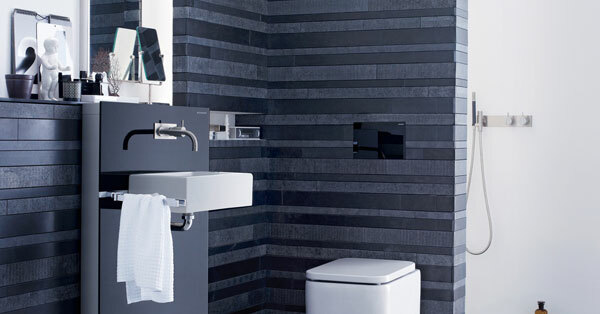 Effortlessly combining design, comfort and hygiene in the contemporary bathroom or washroom, the new Sigma80 touchless flush plate from Geberit has all three in abundance, creating a design focal point in the most stylish of ways. In standby mode no lights are visible on the Sigma80; it is activated as soon as movement is detected. 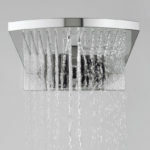 Simply wave your hand in front of the shorter light on the right for a single flush and longer light on the left for a full flush. After giving visual feedback in the form of the coloured light effect when the toilet is flushed, the plate automatically returns to standby mode when the user leaves the room. Featuring the very latest touch-free dual flush technology, the Sigma80 has brains as well as beauty, as the flush plate has a self-learning sensor that will recognise how the users use the WC and learns about its surroundings. What’s more because it has a touchless operation it is supremely hygienic and its striking good looks are never spoilt by unsightly fingermarks. 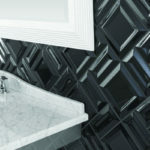 Requiring a mains power connections the Geberit Sigma80 is available in either black or mirror glass and offers 5 different design options as the light behind the glass can be changed in colour to tone with the bathroom to dramatic effect. Suitable for semi-public and domestic applications, the Geberit Sigma80 flush plate is simple to install using Geberit’s tried and tested components and is suitable for use with the manufacturer’s Sigma concealed cisterns (UP320 and UP720). While an automatic flush ensures the toilet is always left clean when used in a commercial setting, the default settings can be easily adjusted during installation to suit the needs of domestic customers.